Banai is the Treasurer, Webmaster, and Past President of UJGS. 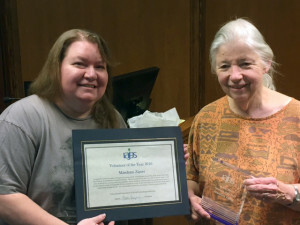 She is a professional genealogist living in Salt Lake City, Utah specializing in Jewish and European research. Sorry for the late notice, but our next meeting is scheduled for October 17th. We’ll meet in the B2 classroom of the Family History Library at 6:30pm. Todd won’t be able to attend and we don’t have anything planned, but we don’t want to cancel so late in case someone had planned to be there. Bring your genealogy questions, brick walls, or family history stories you might like to tell, and we’ll just chat or do some research. We want to encourage our members to make use of the FHL so this might be a good opportunity to get some research done. Also of note, our next meeting in November will be our election. Interested in serving as an officer or board member? Let us know. MyHeritage is available at the Family History Library, making it accessible to our Utah JGS members fairly easily, but it’s always more convenient to search from home, at any hour, with all your genealogy data handy. 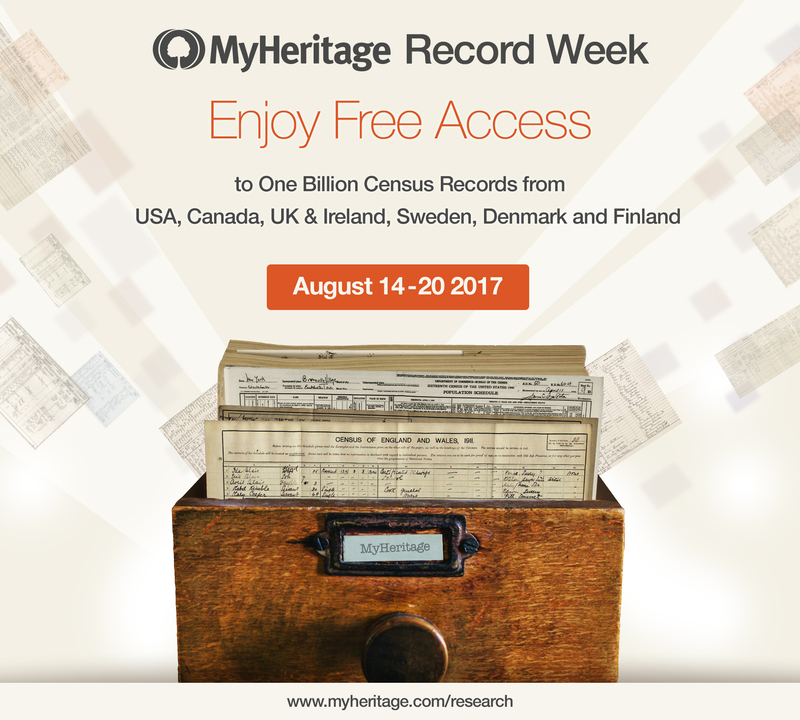 For one week, August 14 – 20, MyHeritage will be making all of its major census collections available for free. This includes the US, UK and Ireland, Canada, Sweden, Finland, and Denmark. They are offering this in celebration of their recent milestone of surpassing eight billion historical records on SuperSearch. So if you’ve been wanting to search the Nordic censuses or you’ve had trouble finding some of your relatives in the other censuses, now is a great time to try another search engine to find them. If you’ve previously uploaded your family tree to MyHeritage, you should look through your record matches as well. They may have already found some listings for you. 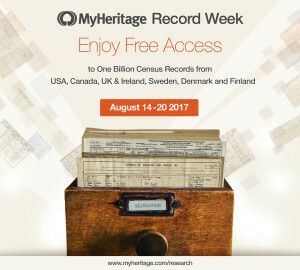 You can visit their blog post about this offer to find links directly to each of the census collections by country. Due to unforeseen circumstances, Todd may not be able to attend our June meeting. And unfortunately there was no other speaker planned. But instead of cancelling our meeting, Banai will be doing an early preview of her upcoming lecture for the IAJGS Conference about her program, Crowd Sourced Indexing. Crowd Sourced Indexing (CSI) was a semifinalist in the 2017 RootsTech Innovator Showdown. Banai will tell you about the program, demonstrate how it works, and she will be looking for suggestions on how to improve the presentation. So meet us in the B2 classroom at the Family History Library at 6:30pm on Tuesday to learn about this new program. We may also have some discussions about the upcoming IAJGS Conference. How many of our members will be attending? And as always, feel free to bring your genealogy questions and we’ll try to help with your research. See you there. A new resource has been made available from Hal Bookbinder. A series of short articles on Practicing Safe Computing have appeared monthly in “Venturing Into Our Past”, the newsletter of the JGS of Conejo Valley and Ventura County. To date, 17 articles have been published. They have been consolidated into a single PDF file and it is freely available. Hal is planning to add new articles over the coming months. Each article is only one page long and talks about general tips for using your computer and the Internet safely, from backing up your data to avoiding scams and viruses. This is a useful resource. Be sure to download the PDF and read the articles. Thank you, Hal for sharing these with us. Sorry for skipping a detail. Our meeting on February 21st will be at 6:30pm, in the classroom on the British floor (B2) at the Family History Library. Did you know that the US National Archive has held a Genealogy Fair every year since 2005? The 2016 Fair takes place on October 26 and 27 and it’s free to attend from home. Some of this year’s sessions include Welcoming Remarks by Archivst of the US, David S. Ferriero; Introduction to Genealogy at the National Archives; The Best National Archives Records Genealogists Aren’t Using; and much more. You can find a list of sessions, times, and links for how to watch from home via YouTube on their web site. At the bottom of the page, you can also find links to previous Genealogy Fairs. Videos, handouts, and presentation slides are online for some, so you can learn even more from past years. For example, the 2014 Fair included a session on Alien Files (A-Files) and the video is available to watch. There are plenty of other interesting titles as well. The 2015 videos are online, so it’s likely the 2016 videos will also be available after the event for those who miss it when it’s live. But do check out the presentations and learn more about researching in our National Archives. Sorry UJGS members, but there will be no meeting tomorrow. Our president has been under the weather and could not make preparations. But if you were planning to be at the FHL for our meeting, don’t let that stop you from going. Even those of us who are there all the time always have more to do. There are lots of resources to help with your genealogy, FamilySearch provides missionaries and consultants to assist. You may even see your society’s webmaster around, so say hello. We’ll let you know when we have plans for future meetings. Happy New Year to all UJGS members, and other interested readers of our blog! It’s a new year, so that means your UJGS dues is due. Our dues is still only $10 per person or $15 per couple. You can pay online using Paypal by going to the Member Login area. If you have never logged in before or don’t remember your password, simply use the Reset Password option. Optionally, you can send in a check. Please note that we have a new treasurer this year. Her address can be found on our Membership Application. We’ve scheduled meetings for the first quarter of 2016. Meetings will continue to be Tuesday nights at 6pm. Our first two meetings of the year will be February 2nd and March 15th. Our first meeting is moved up to the first Tuesday of February to coincide with RootsTech. Our speaker, Israel Pickholtz, is coming all the way from Jerusalem to speak to us about his research in genetic genealogy, Endogamy: One Family, One People. This meeting will be at the Church History Museum auditorium, which is the building just across from the FHL. Additionally, IAJGS will have a booth again at RootsTech. We don’t have many details yet, but if anyone wants to volunteer to help out, we’d be happy to have you. Most visitors to our booth want to talk about Jewish genealogy, and we steer them towards their local JGS (often us!) and our annual conference. Todd has been an active member of UJGS for many years, serving as Treasurer for much of that time. We look forward to striving for his vision of what our society can be. Paula has been a familiar face at our meetings for a while. We look forward to working with her in her new role as Secretary and we hope that she brings some fresh new ideas to our leadership. Banai isn’t going anywhere either. She is continuing as Webmaster and stepping in as Treasurer to let Todd focus his attention on other aspects of his new position. Our new officers, along with other board members, will have a board meeting the first week of December to determine our plans and meeting schedule for next year. We’ll let you know when that is set up and we hope to see you next year at our UJGS meetings.